Isn’t it interesting that we can like one pattern more than another, even when they’re very similar ? Sometimes I have difficulty pinning down why that is, but it’s definitely true with some of the patterns in this month’s Sew Today (December – January issue of UK BMV magazine). Note : Butterick-McCall’s-Vogue has changed their websites. My links now only get you to a page where you can search for a pattern number. If I was still working I would be interested in the Vogue 1141 wardrobe, a Soft Classic look. I’m not a suit person, and luckily I’m retired so finding one I like is not a problem. But it is a relief to know there’s a pattern I wouldn’t mind wearing if I had to. I might omit the pocket flaps on the jacket – their present position is not ideal for someone with high hips ! 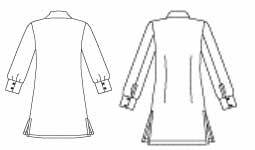 For an intermediate weight jacket, there’s Butterick 5424. 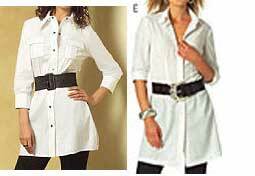 I like cape collars, and this has an interesting and rare feature for a reversible jacket : a fitted waist shape. This is similar to Marcy Tilton’s Vogue 8600 which I’ve mentioned before. 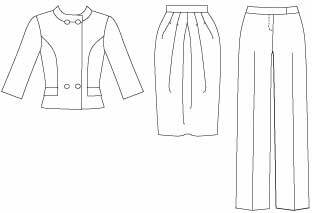 The Butterick looks easier to make. As an outermost layer there is an old favourite of mine, the jacket from Vogue Woman 8526. A lovely padded coat for cold weather, and that big collar makes a hood. Oddly it doesn’t have a closure. Easy enough to add button loops in the front edge seam. What about leisure wear ? Butterick 5409 in the magazine is a current cardigan look, especially view B. But there are several versions of this cut-off sleeve look which I prefer. My favourites are Butterick 5251 (above) or McCall’s 5932 (below), and they have interesting extra choices. Connie Crawford’s new sleep wear Butterick 5434 (smock insert top and loose pants) is the sort of easy style I like. 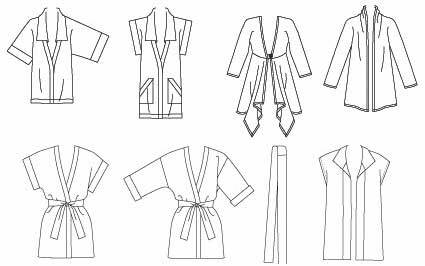 But there are other Butterick patterns with an inset yoke and more flair. For a tunic version my favourite is Butterick 4856. Gathers aren’t right for every body but they are good on me. I need to add some flare at the sides. 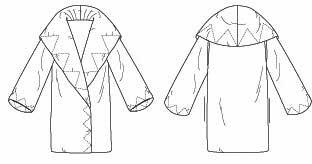 For an open fronted version of this style, my all-time favourite is Christine Johnson’s Inset Jacket 115 for wovens. Though I would add a button band. It’s obvious from the magazine photo that the Connie Crawford Butterick 5434 pants have too short crotch extensions for the model. The strain lines don’t appear so clearly in this scan, especially the ones in shadow on the left (her right) inside leg. Poor girl – not the most comfortable pyjama bottoms. RTW pants often have short crotch extensions, as they ‘waste’ fabric. Happily we don’t have to put up with that when we make pants ourselves. 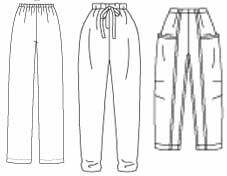 I have a large number of elastic waist pant patterns – get one as a free gift every time I buy a top pattern. For slopping around I don’t suppose there’s much to choose between the wide-leg versions. Slim ones are more of a problem. Around here many young people are wearing pants slim enough to fit inside calf-length fur boots (the look is so important to them they were wearing fur boots even in a warm spell !) But I’m still looking for a slim pant pattern for myself. I’m not sure it’s possible to slim down that far from my hips, but I am searching ! Although elastic waist pants aren’t ideal for my shape, I’m starting my slow search for TNT pants by making elastic waists for simplicity. I’m currently trying Butterick 5044 (left), for one-seam straight leg pants which are well reviewed at PR. Then McCall’s 5889 (centre) for slimmer ones with side seams (much better for my curved hips and saddle bags). Before perhaps moving on to Marcy Tilton’s Vogue 8499 (right) to see if those pockets make my hips look like weapons of war . . . There are many other patterns in this Sew Today issue that I like, but I’ve already mentioned them in other plans ! Comments: Comments Off on The perfect shirt ?